Once the playground of Cambodia’s elites, whose crumbling mansions now provide a forlorn record of the country’s cultural zenith in the 1960s, Kep these days is a sleepy seaside town renowned for its seafood and those spooky remains of that decadent past. It takes some imagination to conjure this heyday from the weekday peace and laidback ambiance, but the revival of a white-sand beach and a throng of holidaying Khmers at weekends hark back to Kep’s popular past. Kep is staging a slow but steady comeback. Over several years, many of the beachside plots, which hosted nothing but ruined villas and tangled jungle for decades, have been snapped up by foreign royalty, merchant bankers, expatriates and wealthy Khmers. While visiting the town’s hotels, it’s quickly apparent that it wants to be more upscale and subdued than Sihanoukville and even Kampot. Much of the accommodation is resort-style bungalow places, although you can find a bed for less than $10 a night at more budget-minded establishments. In a very uncharacteristic step for Cambodia, development here for the most part seems slow, careful and planned. New accommodation options and improving services for visitors may be signs of the changes to come, but much stays the same. Among Khmers, Kep remains best known for its fresh crab, and on weekends hordes of locals descend to eat all the crab they can get their hands on. For Phnom Penh-based expats, Kep remains an ideal weekend getaway. Much of Kep maintains its ghost-town ambiance: although things feel bustling enough by the bus station area above the beach, and the crab market up the hill at the western end, there’s a big stretch of nothing much happening until you reach the town ‘proper’ with the market and Koh Tonsay pier. You may feel that you blinked and missed something, but if you spotted the white naked woman statue, the welcoming crab and the mini Independence Monument, you likely didn’t. Kep’s popularity is based on taking it easy rather than a long list of available activities. The imported white sand beach is not even a kilometre long, but the sea is perfect for a float in a car-tyre or a potter around in a sailboat. The sunsets across the bay to Bokor National Park are stunning and this is a great place for a lazy spell in a hammock. Nature lovers can take relatively easy treks in the national park, or get up close and personal at the Butterfly Farm and Oceanarium. 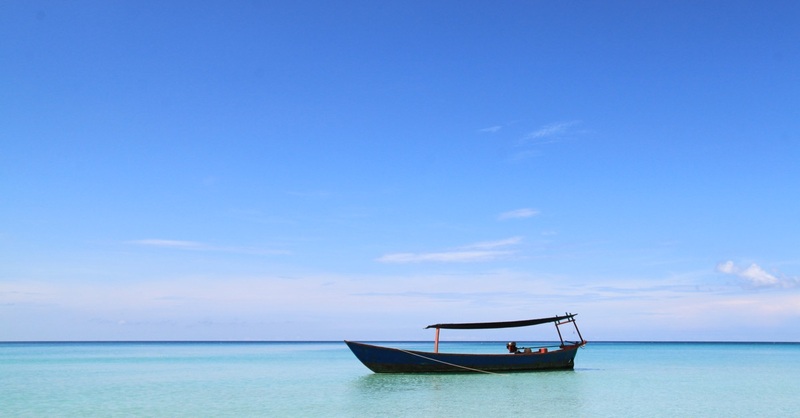 The islands off Kep are worth a visit and we’ve got a soft spot for Koh Tonsay, better known as Rabbit Island. It’s easily visited by boat from Kep on a day trip, though rudimentary accommodation is available should you want to overnight there. It’s also easier to visit farms producing famed Kampot pepper from Kep rather than Kampot — it’s worth stopping at a farm just to see how this world-class product is grown. You can get to the Vietnamese island of Phu Quoc from here very easily now. Buses now leave daily for the four hour bus and boat journey across the border — to Ha Tien in Vietnam via Prek Chak in Cambodia. Tickets cost between $8 and $11 and can be organised by your hotel, or check in with Anna Tours on the market square above Kep Beach. You will need a visa to get across the border as visas on arrival are not available. However, there are some exemptions: Nationals of the United Kingdom, France, Germany, Italy, Spain, Finland, Denmark, Sweden, Russia, Japan, Korea and Norway can enter for two weeks visa-free. Nationals from Brunei and the Philippines can enter for three weeks visa-free, while nationals of Cambodia, Indonesia, Lao, Malaysia, Singapore and Thailand can enter for one month. Everyone else needs to secure a visa before leaving. Tour operators in Kampot can organise a visa for you, which should take three working days. A one-month visa will cost $68 and three months $98. There is an ABA ATM that accepts international cards in the small market square over Kep Beach, and an Acleda one on the way. If you need more banking services, you’ll have to go to Acleda on National Route 33, near the junction between the Kep and Kampot Roads. There is no hospital in Kep, and Phnom Penh should be your destination in case of an emergency. A French doctor is available for consultations at the Pharmalink pharmacy on the market square overlooking Kep Beach. Available hours are Monday to Saturday, 07:00 to 19:00, but you will need to call ahead for an appointment. Contact Dr Christian Vincent Siodmak on (096) 483 6814 or kepmedicalcentre@gmail.com. A consultation at the centre costs $25, while a home (or hotel) visit will cost $50. The Pharmalink pharmacy ((033) 500 477) is reasonably well-stocked, and the staff speak English. You can also pick up toiletries here. It’s closed on Tuesdays and Wednesdays. In that case, you should head to another pharmacy at the other end of town — just beyond Kep Market.  Please sign up as a Travelfish member to download the Kep guide PDF (2 MB, 35 pages). Membership costs just A$35 per year (less than A$1 per week) and gives you access to over 250 PDF guides. Read up on how to get to Kep, or book your transport online with BookMeBus. Use the above map to find specific destinations in and around Kep which are listed on Travelfish. Bed icons indicate a guesthouse, hostel or hotel, the knife and fork is an eatery or bar and the four-way circular thingy marks sights, attractions and other points of interest. Click on any icon for a short pop-up and a direct link to the page for that spot. If you are in the area, use the teardrop icon near the top left to show your position on the map (you'll need to allow position sharing for this last feature to work).